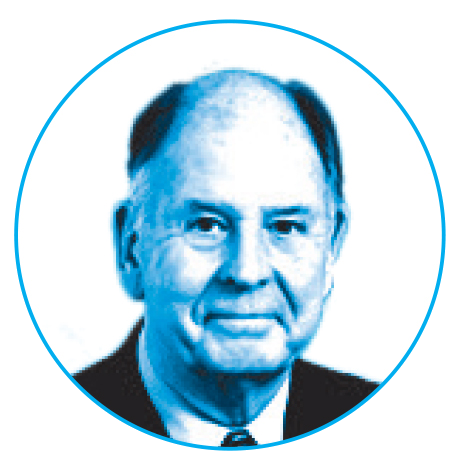 Barrett is professor and chair of the Department of Pharmacology and Physiology in the College of Medicine. In 1989, scientists announced they had discovered the defective gene associated with cystic fibrosis. Many doctors and patients hoped that the breakthrough would be quickly followed by genetic screening tests and drug treatments for the lethal condition, which causes sticky mucus to build up in a person’s lungs and can result in frequent infections, difficulty breathing and a lower life expectancy. Instead, more than two decades passed and some 600,000 ineffective chemicals were ruled out before researchers found a single molecule capable of combating the underlying cause of the disease. It wasn’t until 2012 that a new drug, Kalydeco, was approved for a small number of people with a particular mutation in the gene that causes cystic fibrosis. The 23-year journey illustrates how challenging it is to bring scientific discoveries to market as effective new drugs, diagnostic tests and biomedical devices. Enter Drexel’s new Clinical and Translational Research Institute (CTRI), launched this year with the goal of being fully operational over the next five to seven years. Housed within the College of Medicine, the CTRI will secure early-stage funding for promising research and share data, equipment and knowledge among University-wide researchers to foster multidisciplinary collaboration — all with the goal of bringing promising critical therapies to market, faster. “The CTRI represents the most logical venue to integrate Drexel’s innovative basic science ideas and capabilities to help generate applicable therapeutics to benefit sick people,” says Daniel V. Schidlow, MD, the Walter H. and Leonore Annenberg Dean of the College of Medicine. CTRI Founding Director James E. Barrett has spent the past six months traversing campus to meet with clinicians and researchers and determine what they can potentially bring to the table. The breadth and depth of resources available for sharing at Drexel is “stunning,” he says. University-wide, researchers are already working on some early-stage therapies — treatments for ALS, cancer metastases, traumatic brain injury, tuberculosis and solutions to the side effects of HIV medications, to name a few — that could benefit from the resources that the new CTRI will make accessible and the funding that the CTRI can provide to accelerate these therapies and enable them to receive additional grants from outside sources. One investigator is Michele Marcolongo, a Drexel professor of materials science and engineering who has previously co-founded two companies with novel technologies she developed that treat lower back pain. Her lab designed and synthesized a novel molecule that closely mimics aggrecan, the natural molecule shown to regulate water uptake in every tissue in the body. An injection of Marcolongo’s synthetic molecules could act to replace diseased or damaged tissues and prevent intervertebral disc degeneration, which happens when spinal discs “dry out” and are no longer effective as shock absorbers. She is now working with the CTRI and Mary Mulcahey, MD, an orthopaedic surgeon in the College of Medicine, to further develop the technology for patients with arthritis. CTRI will help researchers secure early-stage funding for pilot projects using funds of its own (currently approximately $450,000 with plans for an increased amount next year) and outside grants. The institute reached an important milestone in April when it awarded its first batch of seed funds to support “proof of concept” experiments and other proposals of clinical and translational significance. Six projects were selected from 35 applications to receive one-year grants of about $75,000. Each proposal was reviewed by three independent reviewers for scientific merit, “fit” with the CTRI objectives, and the qualifications of the principal investigator and the investigative team. The projects that were chosen have objectives ranging from neurological experiments, to testing plasma exchange therapy as a treatment for individuals with complex regional pain syndrome (CRPS), to experimenting with a novel molecule designed to cost less and last longer in the treatment of arthritic knees. Though CTRI is in its infancy, promoting translational research requires key investments in research-enabling infrastructure and resources, says Kenny Simansky, vice dean for research in the College of Medicine and a professor in the Department of Pharmacology and Physiology. “What has been a big impediment across the campus and in health science research in particular has been the inadequate range and capacity of core instrumentation to serve cutting-edge research,” Simansky says. “Drexel needs to develop a broader range of capabilities and much more up-to-date and powerful instruments to help answer those complex questions required in the current biomedical and life sciences.” CTRI will be a magnet for attracting industry partners, he predicts. The new CTRI will combine a number of key research cores. The first is already in place. The new Genomics Core Facility headed by Garth Ehrlich, an internationally recognized professor of microbiology and immunology in the College of Medicine, opened in the spring. Ehrlich’s labs feature advanced technologies and equipment including a new, $1 million, third-generation Pacific Biosciences DNA sequencing system that will make it faster and easier for researchers to assemble or build genome models, and a cutting-edge system for studying gene expression. Scientists studying bacterial invasion of human cells and infectious disease in particular will benefit from the services, Ehrlich says. Ninety-nine percent of bacterial species cannot be cultured in the laboratory. Until the advent of these technologies, it wasn’t possible to perform full genome sequencing on these organisms. Now, they might also have a way to “teach old bugs new tricks,” he says. The Genomics Core complements a planned Biorepository Core Facility — a sort of library of fluid and tissue samples and other biospecimens collected from various university studies that are preserved and made available for other studies. Another core facility will be dedicated to bioinformatics, in which powerful computers analyze and interpret massive amounts of biological data. As more personal clinical information becomes available for research, bioinformatics units help universities to better centralize data gathered from different labs, clinical investigations, patient electronic health records and epidemiological data in public health to spur new ideas for investigations and discoveries. High expectations are riding on the new institute. “The last several years I felt there were some limitations in my ability to pursue certain kinds of research, just because there wasn’t a solid infrastructure that would allow me to develop complex projects at the proper speed and in a competitive way,” says Olimpia Meucci, MD, CTRI’s deputy director and a professor of pharmacology and physiology in the College of Medicine. It typically takes 14 years to move a new therapy discovery to FDA approval. Less than 5 percent of new therapies ultimately win an FDA nod, and the cost of bringing one to market averages $2 billion, according to the National Institutes of Health. Twenty-five times more money is spent today on therapeutic development than 50 years ago, yet the number of drugs approved each year remained virtually unchanged. Collectively, the new infrastructure will facilitate the involvement of clinical investigators in research and will help Drexel researchers outside the College of Medicine do clinically relevant research, she predicts. 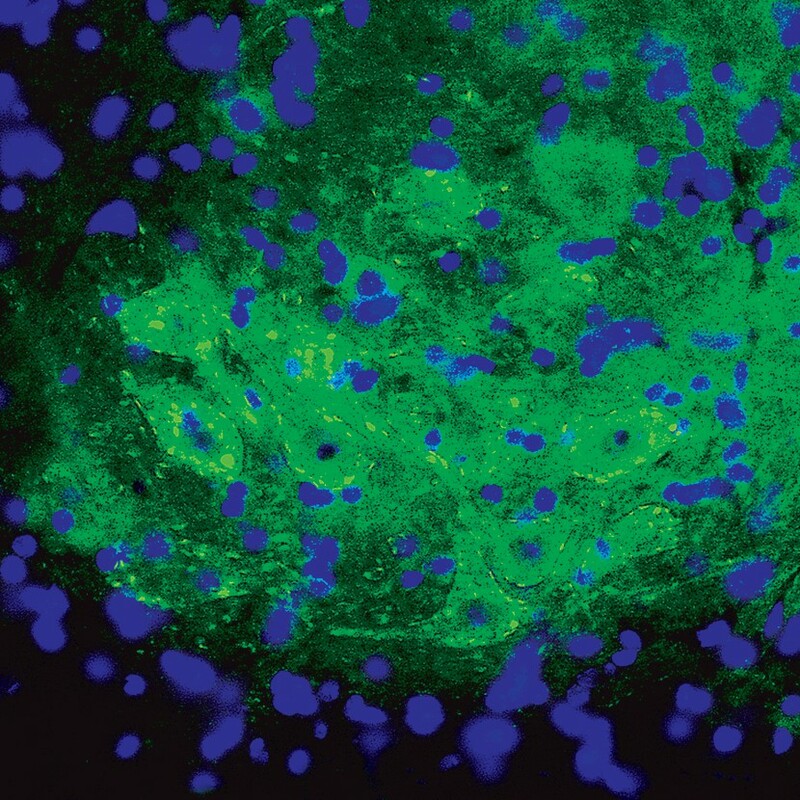 “We may discover individuals at Drexel of whom we were not aware before, who can help in our investigations,” says Jeffrey Jacobson, MD, a professor of medicine in the Division of Infectious Diseases and HIV Medicine in the College of Medicine. He’s optimistic that CTRI will make Drexel research more competitive for outside research funding. A long-term goal of CTRI is the creation of new academic programs to train medical and graduate students and postdoctoral fellows in translational research, building on Drexel’s master’s program in drug discovery and development and other initiatives within the graduate program. CTRI will also work to engage the local community in outreach, clinical trials and medical information. If all goes well, Barrett has a much larger, concrete ambition: “I want a building,” he says. Ultimately, the key to CTRI’s success will be getting clinicians and researchers to embrace the multi-disciplinary approach that translational research requires. “Believe it or not, some faculty don’t pay attention to how translational their findings are,” Barrett says. “They are interested in a particular mechanism, characterizing it, exploring it, but not how it could be used therapeutically to develop a new drug. They may just not have resources to move it to the next level. Part of the barrier that exists is simply not knowing what resources are available and ensuring those are available for Drexel researchers to advance their projects. “Having a center to coordinate these activities… can really move things forward much more quickly” and will substantially elevate the culture and climate in which biomedical research at Drexel is conducted and capitalized, he says. Mouse spinal cord at 20x magnification, showing a cluster of motor neurons immunostained green for Sigma1. Sigma1 is being studied at Drexel as a player in the progression of amyotrophic lateral sclerosis (ALS), a fatal neurodegenerative disease that causes progressive loss of the motor neurons that control muscle contraction. 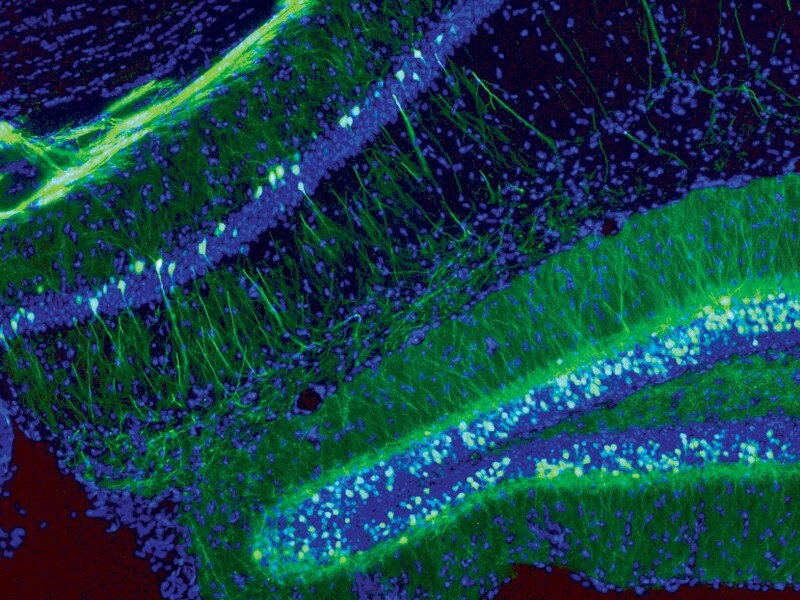 Mouse hippocampus at 10x magnification, with a subpopulation of neurons genetically labelled with GFP (green color). The hippocampal formation is involved in many brain functions, including learning and memory, spatial ability, mood and emotion and is therefore actively investigated by researchers studying conditions such as autism, depression, attention deficit disorder and chronic pain. Mouse cerebral cortex at 10x magnification. 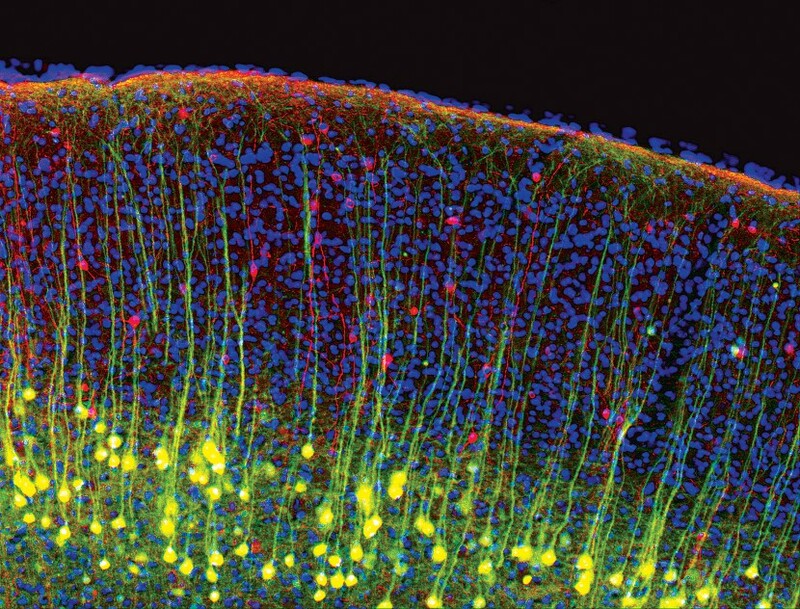 Cell types are labeled by color: excitatory pyramidal neurons are green/yellow, inhibitory interneurons are red and cell nuclei are blue. Each neuronal type has a specific role in processing sensory information reaching the cortex. 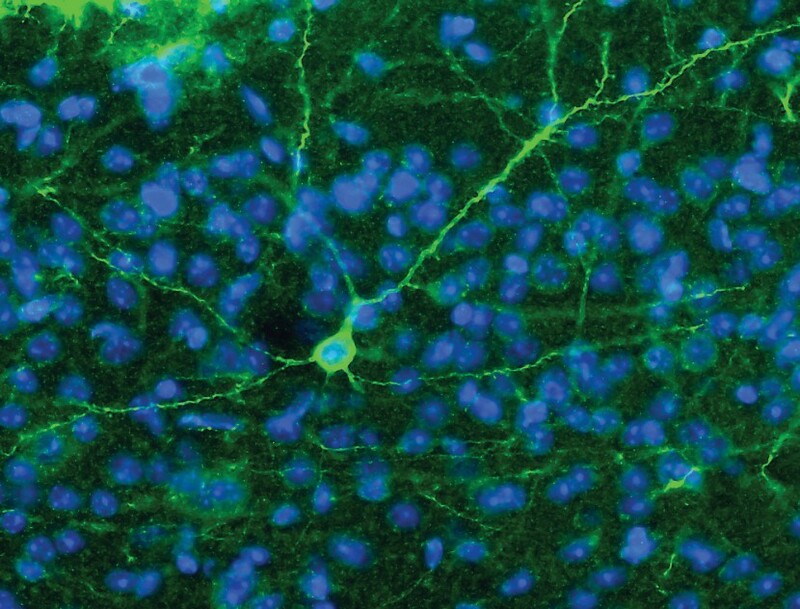 This 20x magnification of a mouse cerebral cortex shows a pyramidal neuron transfected with the genes for channelrhodopsin 2 (ChR2) and GFP (green fluorescent protein) using a lentivirus. While still at an experimental stage, the clinical potential of optogenetics is being actively explored in pathological states such as Parkinson’s disease, chronic pain and drug addiction.